Like many an end-times horror before it, Bird Box has brought humanity a terrifying vision of the apocalypse. The Sandra Bullock fronted Netflix film reveals a world where venturing outdoors without a blindfold means facing a horrifying death. Differing somewhat from other survivor group movies, the regulation supermarket supplies run is made even more perilous by the fact nobody can see where they’re going. A klutz such as myself would no doubt last around two minutes, birds or no birds. From the moment Malorie (Bullock) delivers her stark warning to Boy and Girl about the gruelling, blindfolded mission ahead of them, viewers became certain this was a reality no-one would ever choose…Or would they? Although it’s perfectly safe this New Year’s Day to fling open your front door and gaze around at your 2019 surroundings, this doesn’t mean you can’t immerse yourself in the full Malorie experience. 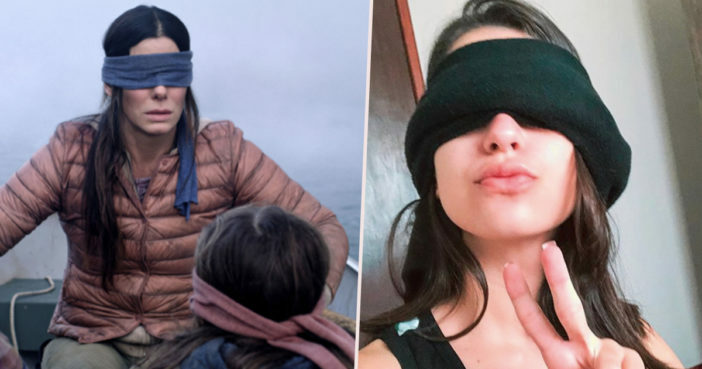 Fans of the tense new scream fest have shown their appreciation through the ‘Bird Box Challenge’, a viral challenge whereby participants try to carry out various tasks while blindfolded, often with hilariously uncoordinated results. We’ve had dancing challengers and hair brushing challengers. One set of people even attempted to grapple with an escalator while blindfolded. Others bravely tried out a Bird Box style work-out. Some participants have given truly theatrical performances, channelling their inner Malorie to urge their fellow challengers in a stern but ultimately heartfelt manner. One hilarious family even re-enacted one of the dramatic river bound scenes, paddling for dear life in a bathtub as if being chased by a hoard of spooky monsters. Bird Box has proved quite the online sensation, offering viewers a satisfying jump scare at the end of what’s been a rather good year for the horror genre. However, it’s not just Sandra Bullock who’s found herself rowing awkwardly against rocky waters. Netflix has raised a few critical eyebrows after boasting about the film’s success on Twitter. A worthy accomplishment indeed. However, some have queried where exactly Netflix pulled these figures from; pointing at the service’s reputation for closely guarding its data.